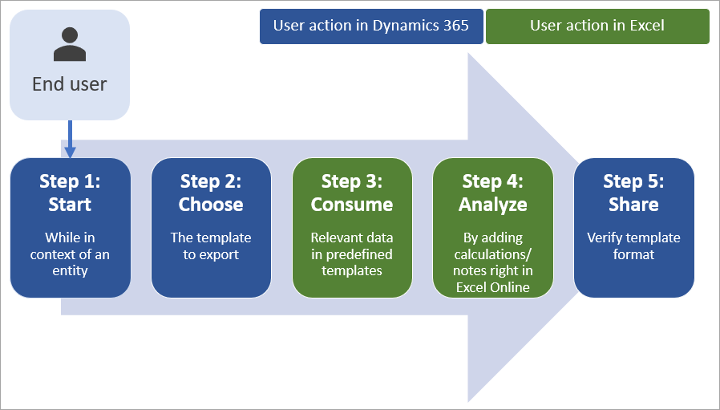 You can export Dynamics 365 data to a Word or Excel template to create standardized documents that you can share with people who don't use Dynamics 365. You can export the templates that are included in Dynamics 365 for Sales, modify them, and then reimport them as new templates. This can give you a running start on creating your own custom Excel templates. You can export information from a single record by using a Word template, which formats the information into a readable and sharable document. Open a record, such as a single contact, with information you want to use in your document. Only templates built for the selected record type (entity) will be displayed. For example, you won't see a template created for accounts when you are working with a contact. If you are looking for a brand-new template, you might need to refresh the page to see it. Either refresh your browser or close and reopen Dynamics 365. After you select your Word template, Dynamics 365 creates a Word document from the record you selected. You can export information from a multiple-record list by using an Excel template, which formats the information and generates graphs to create a readable and sharable workbook. In Dynamics 365, select a record type (entity) to export to an Excel workbook. For example, go to Marketing > Lead Management > Leads. On the command bar, select Excel Templates to open a list of available templates, and then choose the one you want to use for the export. Dynamics 365 generates your Excel workbook and downloads it to your computer. Rows: Your Excel workbook includes a row for each record that was visible in the view you exported from. Columns: The columns correspond to the fields in a record. The template you used determines which columns appear in the table in the exported Excel file. Save a copy either online or to your computer, and then share the workbook or link with others for their review and input.